So few dishes require as little work as this easy asparagus recipe with a Mediterranean twist. But there is so much to celebrate about this bright and flavor-packed asparagus! Be sure to see my tip for how to cook asparagus. This easy Asparagus recipe makes a glorious appetizer, salad or side dish. There is no wrong way to serve it, and it’s very simple to prepare! I’m fond of roasted veggies, but asparagus is one of the few I also enjoy blanched. Blanched asparagus is super quick, and you really can’t mess it up. All you do is plunge the asparagus in quick boiling water, then refresh in an ice bath. This keep them crisp-tender and preserve their bright green color. Now, the Mediterranean slasa in this asparagus recipe is far more than a pretty garnish! Sweet cherry tomatoes with shallots and fresh herbs like parsley and mint (or basil). Loads of flavor! 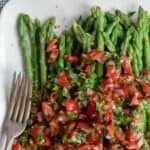 This easy asparagus recipe is truly the sum of its parts, so it’s important to grab the best quality ingredients you find from the asparagus, to tomatoes, and fresh herbs that are firm, bright, and not wilted. And topping all that is excellent quality extra virgin olive oil. Because the EVOO is used raw here, it’s flavor and qualities will be obvious and can lend another great dimension. I used our Early Harvest Greek extra virgin olive oil (top-of-the-line, cold pressed from organically grown and processed Koroneiki olives). Learn more here. Easy asparagus recipe with a Mediterranean twist! 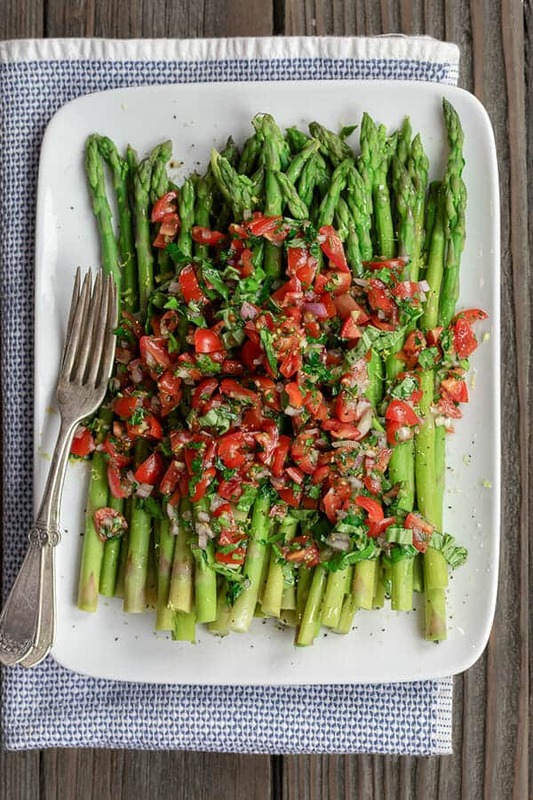 Bright, simply blanched asparagus takes on a flavor-packed Mediterranean salsa with tomatoes, shallot and fresh herbs. Serve it as appetizer, salad, or side dish! Vegan. Gluten Free. Make the Mediterranean salsa. In a mixing bowl, add the tomatoes, shallots, garlic and herbs. Season with salt, pepper, and sumac. Add lemon juice and a generous drizzle of extra virgin olive oil. Mix and set aside so flavors will meld nicely (or, if you prefer, cover and chill until ready to serve). In a large sacuepan, bring 8 cups of water to a boil. Seasoned with 2 tbsp salt. Have a large bowl of ice water ready next to it (ice bath). When ready to serve, arrange the asparagus on a serving platter. Season with salt and pepper. Add a drizzle of good extra virgin olive oil and lemon zest. Top with the Mediterranean salsa. Enjoy! Prepare ahead Instructions: you can serve this at room temperature or chilled. If you plan to prepare ahead and chill, you can do so a few hours or one night in advance. 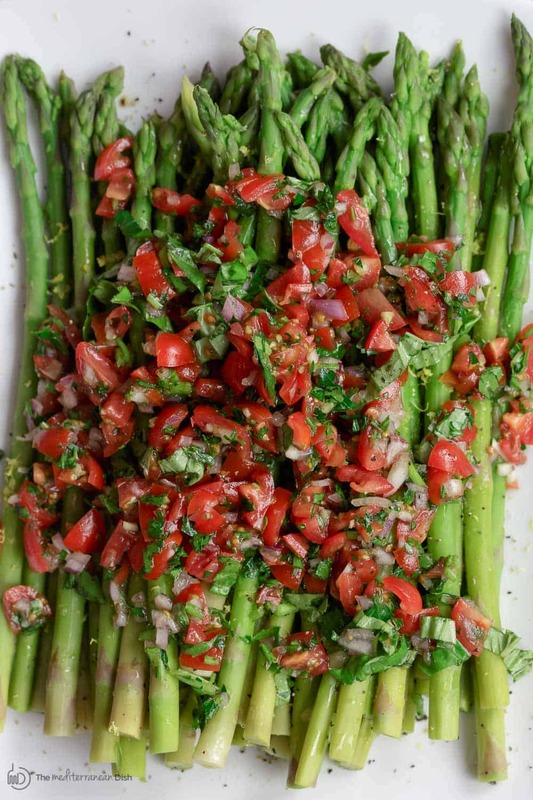 Store the Mediterranean salsa and asparagus separately in the fridge, in tight-lid containers or well-wrapped. Recommended for this Recipe: Our Early Harvest Greek extra virgin olive oil (top quality oil from organically grown and processed Koroneiki olives), and from our all-natural spice collection, Sumac. SAVE! Try our Ultimate Mediterranean Spice Bundle or Create your own 3-pack or 6-pack of spices. And our Greek Olive Oil Bundle! Thank you so much, I have a home run dinner, I will make again an again. Milena, thank you! I’m so glad to hear this. 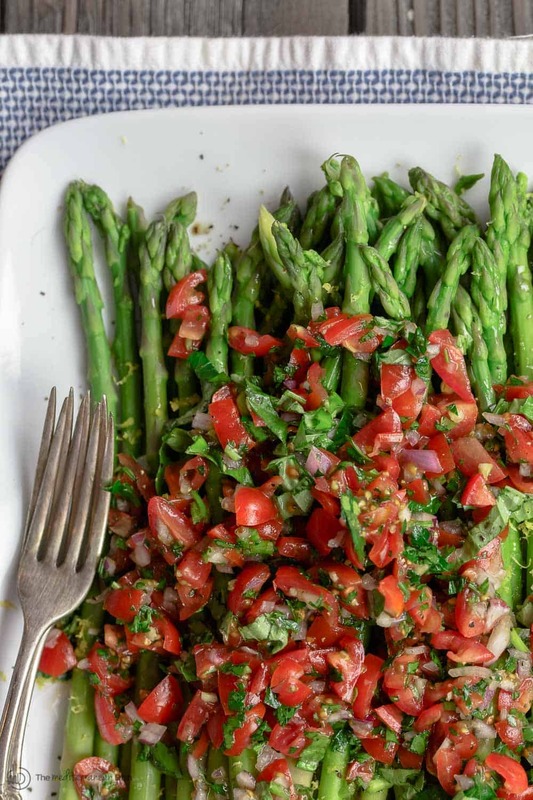 Beautiful color contrast between the asparagus and the salsa! That looks so fresh and simple! Thanks, Kellie! It really is! I am not a huge asparagus fan but I think i might like this! Yay! Thanks for giving it a chance! I have a couple of asparagus recipes I make over and over in the spring. I’m happy to have your fabulous Mediterranean salsa for a change of pace! Yay! Thanks, Liz. Hope you give it a try! In the Mediterranean salsa you have a 1/4 of mint leaves. Is that tsp., TBsp. Or cup. oops, so sorry Roxanne! Thanks for catching that! 1/4 cup.